Naval robotics engineers remotely operated a bomb disposal robot November 28 using radio signals relayed from a University of Maryland unmanned aircraft vehicle soaring more than a mile overhead. The operation is the highest altitude test conducted by the Unmanned Aircraft System (UAS) Test Site since launching in 2015. Military personnel rely on the Man Transportable Robotic System—better known as Packbot—to identify and clear explosive devices encountered in the field. With traditional radio technology, operators must stay within hundreds of feet of the vehicle, where they are vulnerable to harm from surrounding explosives. The UAS Test Site, along with partners from the Naval Air Warfare Center Aircraft Division (NAWCAD) and Naval Surface Warfare Center (NSWC) Indian Head Explosive Ordnance Disposal Technology Division (IHEODTD), are working on a configuration that could extend the safety buffer to tens of miles. 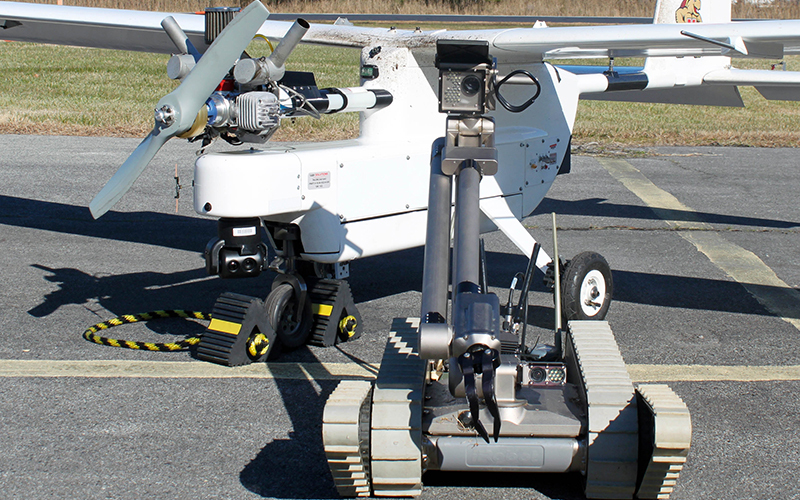 Successful connection to the Packbot was made during a two-day operation ran out of Crisfield Municipal Airport and with permission to fly in Naval Air Station Patuxent River restricted airspace. Throughout the five test flights, pilot Ryan Henderson stepped the fixed-wing Talon 240G up in altitude and modified flight paths while Jacob Moschler adjusted antenna and reconfigured bandwidths in search of the strongest connection to the robot located roughly half a mile away. “The communication link between the robot and the operator is particularly demanding because we have to transmit high bandwidth video that needs to be free of lag or latency, or else it is impossible to precisely control the robot,” O’Toole explained. “By testing different flight patterns over the multiple transmission and reception antennas on the ground, we were able to hone in on the ones that allow us to maintain the right rate of transfer and delay to control the robot,” added Moschler, a project engineer with the UAS Test Site. Another phase of testing using UMD’s larger, more complex TigerShark vehicle is slated for late spring 2018. Moschler, Henderson, and others will spend the intervening months troubleshooting the radio signal relay and determining how to best integrate the needed antennas and other technology into the TigerShark. Images and b-roll of the tests are available at go.umd.edu/communicationsrelay.